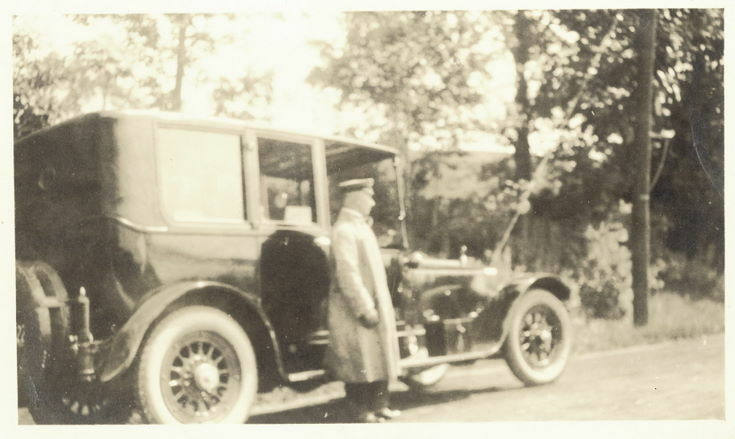 John Chisholm standing beside a 1912 Rolls Royce, fitted with a new body in 1924 at Skibo. Two copies. Came with material relating to Jean MacKay. could this be the same car? Both myself and father have owned this car since 1969 and hunted high or low for photos. Further photos and any info wanted, no matter how small. Very keen to find full history of this car. If any one can add to these photos of Rolls Royce NS165, which left the Carnegie family in 1946 and went to the John Sword car collection, I would be very grateful. Any information welcome, no matter how small. I have some paperwork here lists of owners of NS number plates which indeed confirms Andrew Carnegie owned a Rolls Royce Landaulette (40-50 HP) in royal blue with primrose lining. I have one further photo which looks to be taken the same day as the one above, apparently showing the same Mr Chisholm driving. ~ Thank you for your comment. ~ Administrator.